There are so many great buildings to visit and places to see in Washington DC that last time I was there I missed quite a few of the ones I wanted to do most. I almost forgot that the Library of Congress existed, and the Senate Building was undergoing construction work in preparation for the 2016 Presidential election so we never really went to that end of the mall to see anything. This time I was ready to change that, and both places were pretty high on Emma’s list too so it was a no brainer! After walking a long way on Day 3 of our trip, we had the brilliant idea to try and keep our day to a walking minimum. It didn’t happen, but it was a great day. Months before our trip, weh we first decided we were going, we applied online for a Senate building tour. Like all great things in DC, it’s free (Chipotle is the obvious exception to this rule) so we booked ourselves onto an early tour. It was pretty easy to get to by metro again, and we had time to take pictures and see the building up close before it got too busy with workers and tourists, before heading inside. We were actually touring the building on the day that congress returned from its summer recess, so we knew that officials would be present and everything would feel very, well, official, and that was exciting in itself because we managed to score passes to get into the chambers while the officials were sitting. We started the morning with the tour of the building itself. We Brits didn’t get out of it lightly considering our past with the US and the fact we quite literally burnt the building to the ground in it’s semi-recent history, but it was none-the-less fascinating to see round the chambers and the hallways that make up the US governmental building. There was a huge difference in the feel of some of the rooms as well, the main atrium with the dome over it was light and bright, with amazing busts of influential past presidents, whereas the small Senate Justice chamber was intimate and dark and not at all similar. It was properly interesting to see the room of state representatives, where there are statues of people that are renowned in their fields, I believe each state was allowed two and it was fascinating to see who each state had selected as their representatives. On the way out we collected our passes, and later returned to see the senate chamber. The senators had already checked in and left, but it was still cool to see it active on a working day. 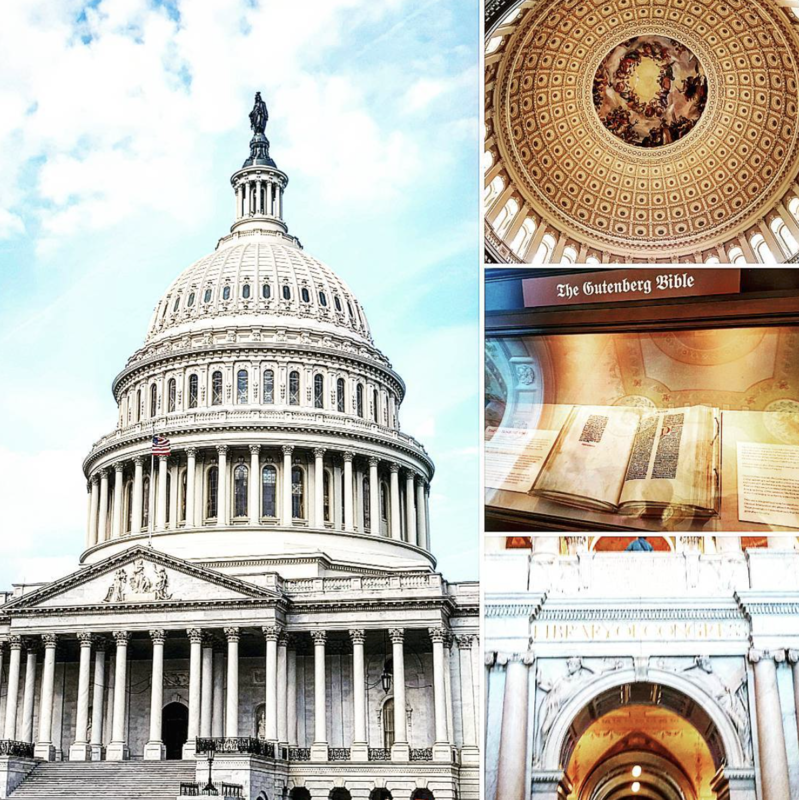 After the Senate, we popped next door to the Library of Congress. I use the term next door loosely, it was one of the closest buildings on the huge mall, and was something we were umming and ahhing about going on a tour of, so when we arrived and there was an old and knowledgable codger there to show us round (with some other tour people too of course) we decided why the heck not. It was really informative, and we probably saw more things and learnt a lot more than if we had just walked round ourselves. The reading room was incredible, it was cool to see a real life Gutenberg bible, and we even managed to find the café in a sister building. They seemed a little confused as to why we’d want to go there or even how we found out about it, but it’s open to the public and served really nice and cheap food (even if we were the only non-workers there). It was a great find. 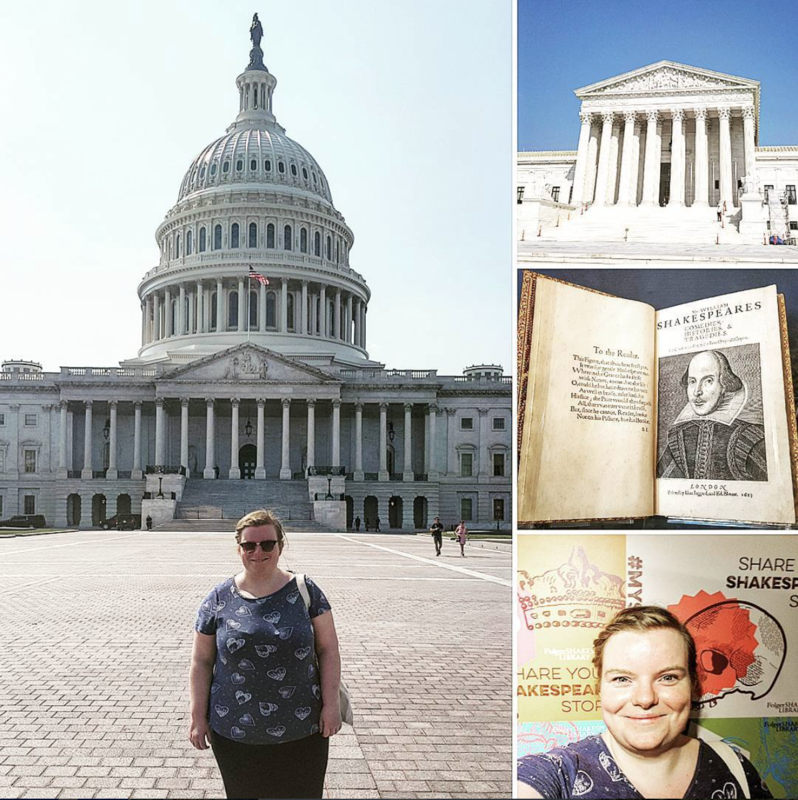 Emma is a big fan of Shakespeare, and his work formed a large part of her academic work, so she wanted to take the opportunity to visit the Folger Museum. The Folger museum/library is the largest owned collection of Shakespeare works and related information, works, folios, and welcomes people from around the world to study and visit. It’s slightly annoying that the largest collection of his works is in the UK in a privately owned library rather than in the UK, but it was impressive and the guy who decided to show us round and answer some of our (Emma’s) questions was passionate and knowledgeable which is all you can really ask for. Even I thought it was pretty interesting to be fair. After tours upon tours, books upon books, and a heavy day of buildings and history, we called it quits early and headed to yet another Chipotle for tea, and returned to the hotel. Yes, we were having another early night, but a hard to get Pentagon tour and a day of museum hopping was to follow and we knew it would be another day of walking far and seeing lots of things.